Memory is a curious thing. It can make one nostalgic for things that perhaps were not good. It can also make us quickly forget how soon or long-ago something happened. Such is the case with Robin Hood. It has been just eight years since our Chief Merry Man had the cinematic treatment in a failed franchise starter with a very unmerry Russell Crowe as our title character. Now we turn to Taron Egerton, who at 29 may be the youngest actor to take the role. 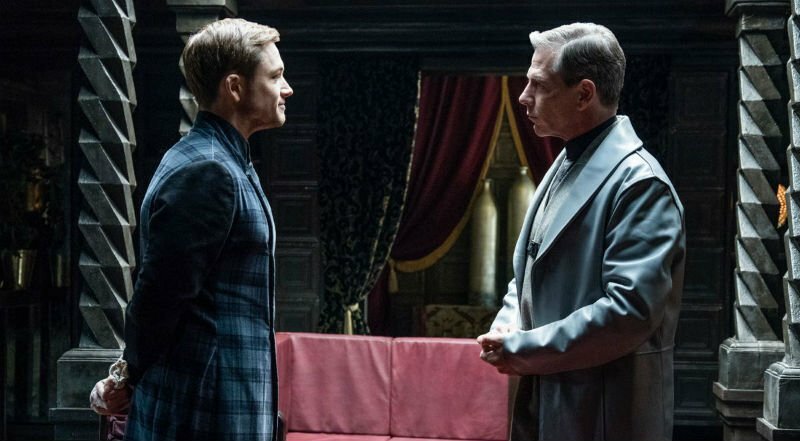 He's done the action/franchise thing already with the Kingsman films, so why not have another go at a new series? 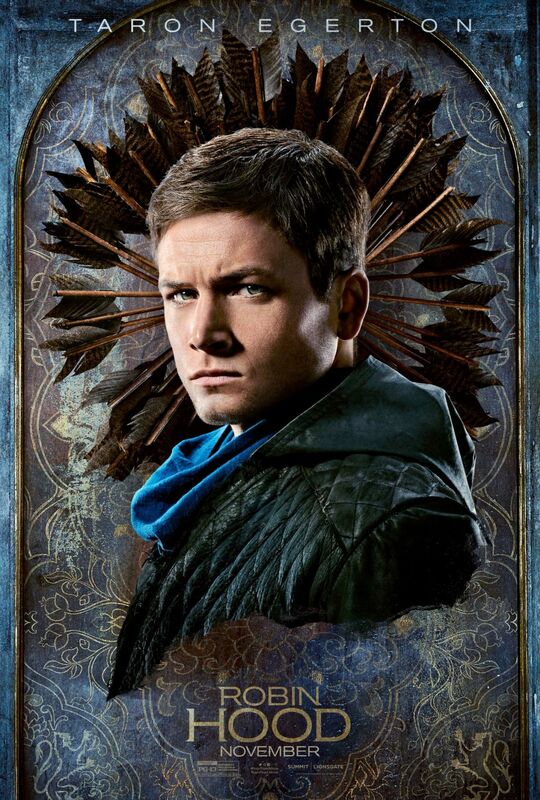 Robin Hood was originally titled Robin Hood: Origins, but perhaps in the only sane decision involving this film, they dropped the obvious signal that this was meant to be the first part of a Sherwood Forest Cinematic Universe. Robin Hood is not the worst film I've seen this year, but it is perhaps the funniest one...funnier even than Robin Hood: Men in Tights, and that one was meant to be a spoof. Robin Hood 2018 just ended up as one. Robin, Lord Loxley (Egerton) is a wealthy Englishman who catches a horse thief. Twist: it's a woman named Marian (Eve Hewson). Very quickly an affair begins until the Sheriff of Nottingham (Ben Mendelsohn) drafts him into the Third Crusade. I mean literally: Robin gets a letter with the words 'DRAFT NOTICE' and that this is the Third Crusade. At this point, the first thing that popped into my head is when Bugs Bunny is aghast to find that he was drafted, but I digress. Off to 'Arabia' Robin goes, where he and his fellow Crusaders, in uniforms closer to Desert Storm gear than Crusader clothing, go through a combination Gears of War and Medieval Sniper, leading to the capture of Moors. One of the Moors sees the Crusaders behead his son, though Robin tried to stop the beheading. The only thing saving Robin is that he's a Lord, so he's sent back to England rather than killed outright. 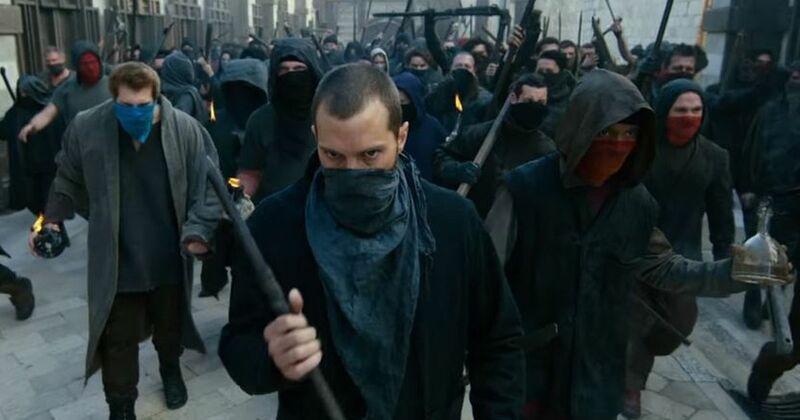 Back in very unmerry England, Robin finds himself declared dead, his properties taken, and Marian married, or at least involved with Will Tillman (Jamie Dornan), who is something of a politician. The Sheriff, having gone full Trump with the "give me money or those invaders will come here" shtick, is bleeding the population dry while they work in the mines. Robin is astonished to find the Moor in Nottingham, the Moor having stowed away on the ship for three months. He survived undetected because...reasons. Now going by John (Jamie Foxx), he will train Robin or 'Rob' as he's more often called to thwart the Sheriff and do a little redistribution of wealth. However, Rob has to have a secret identity...the Batman, I mean, the Hood. Rob has to cotton up to the bonkers Sheriff while simultaneously robbing him blind. This is complicated by his continuing desire for Marian and the moderation Will seeks. He does have an ally in Friar Tuck (Tim Minchin), who knows something of the inner workings of the Catholic Church, which is also in cahoots with the Sheriff in some really bonkers scheme to play both ends in this war against 'the Christians' and 'the Muslims' and take the throne. In the end, Rob inspires the people to rise up against their oppressors in Nottingham, especially after the Sheriff has ordered the mines and nearby homes cleared. This leads to an epic street battle between the Sheriff's troops and the population. We end with Rob, Marian and many other men heading to Sherwood Forest, while the wicked Cardinal (F. Murray Abraham) appoints a new leader. Yes, there literally is a new Sheriff in town...Will Scarlet-Tillman, his transformation into the Dark Ages Two-Face act now complete. Political messaging in Robin Hood? It is apt that Robin Hood was released on this Thanksgiving Day weekend as it is a most delightful turkey. First-time screenwriters Ben Chandler and David James Kelly decided that their Robin Hood was going to be hip, contemporary, brimming with allegory if not downright insightful social commentary. What they accomplished was to both virtue-signal and show themselves to be inept at just about every element. You can look at how they thought they were being clever by having parallels between the Nottingham peasants (who are curiously multicultural for Tenth Century Britain) and Antifa protesters. You can see the same in Robin's call for 'a distribution of wealth' (his exact words). You can look at how they thought they were being hip by having almost everyone call our title character 'Rob' as opposed to 'Robin' (as perhaps 'Robin' isn't what the kids look for in a hero). You can see the same in the outfits our characters wear. Robin seems fond of Nehru jackets, the Sheriff wears what appears to be a coat borrowed from the Star Wars films, and with his beanie and long hair one would not be surprised if Friar Tuck played hacky sack between confessions. You can look at how they thought they were being contemporary with what can be described as a Medieval Rave. At the party where Rob keeps up his 'false identity', the decadent elites in their far-out costumes and casino setting (because roulette tables were routine in this era), I was genuinely surprised they didn't actually have thumping techno music blaring. The only thing Chandler and Kelly showed themselves to be was essentially thieves, ripping off Batman Begins & The Dark Knight in terms of plot, with touches of American Sniper and V for Vendetta at the very least. I don't think the whole 'secret identity' has been the focus or a major part of the Robin Hood mythos, at least not to the degree Robin Hood has had it. Not that first-time film director Otto Bathurst did himself any favors with any non-script ideas. I don't think we've seen such a lousy collection of acting in a film. Egerton is not without talent, but the only thing he offers here is cockiness, and cockiness doth not a hero make. Apart from the obligatory shirtless scene where he shows how much he's worked out this Robin comes across as not really changed all that much from his war experience. Hewson's Marian similarly has nothing to go with, and worse, the efforts to make her more 'heroic' and 'strong' fall flat when our introduction to her has her disguising everything but her cleavage. She speaks as if she has a faint grasp of English. Dornan continues to show he cannot act, and this time he does not have his body to show off as he did in the Fifty Shades films. His Will makes it hard to imagine anyone would wonder why Marian wavers between the two. And why is he Irish? Accents are a puzzle, especially with Foxx who slips between vaguely foreign and American. He is so irrelevant as John (and at 5'9" he would be among the smallest Little Johns in film history) that when he disappears for long stretches I genuinely forgot he was even in the film. Mendelsohn has cornered the market on 'crazed villains' at this point, and he either has embraced the hamminess of it all or just decided Robin Hood was dress rehearsal for the next Star Wars film. The scene between Mendelsohn and Abraham was hilarious in terms of how they seemed to try to out overact the other. Both of them were so over-the-top individually that together they were a laugh riot. Minchin seems to be the only one who might escape relatively unharmed, his Tuck more a bumbling muddled but well-meaning figure than anything else. I do, however, wonder how he came to own spectacles, but historical details are unimportant in Robin Hood. You can tell by the costumes which were a bit too contemporary for the times and the sets that made Nottingham look like a theme park. The film sets up a sequel, just like King Arthur: Legend of the Sword, another film it cribs from shamelessly. Robin Hood won't earn enough to make a follow-up, and even if it did, with bad acting and a terrible shambles of a story why would or should there be?